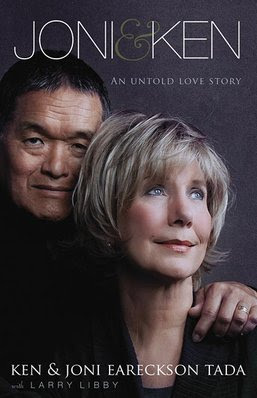 Ken and Joni Tada, along with Larry Libby, recently wrote a book about their 30 years of marriage. Joni has been a quadriplegic since the age of 17 when she broke her neck in a diving accident. She also suffers from severe chronic pain, and she recently battled breast cancer. Ken and Joni know what it is like to suffer and struggle through marriage with a disability, and in this book they share about their struggles and triumphs. It is rare to find a book that talks about marriage and disability and to now have one written by Ken and Joni Tada is a treasure. In this book, Ken and Joni give us a glimpse into their life as a married couple. It is a beautiful story of how God brought them together and what He has done in their lives and in their marriage. Ken and Joni have faced very difficult times in their marriage, and have come through it stronger, more in love with each other, and with a deeper love for Christ. Ken and Joni share about their testing years, during which Ken was very depressed. Joni’s quadriplegia was wearing on him. The day in, day out struggles of living with someone with such a profound disability had taken its toll. “Somewhere along the way, the never-ending demands became abrasive, scraping away at the romance of their marriage, grinding down perilously their resolve to go on” (page 84). In 2010 Joni was diagnosed with breast cancer. This was on top of quadriplegia and on top of chronic pain. Life was going to become even more challenging, but God had been preparing Ken to walk through these hard years with his wife and to faithfully care for her. Throughout the cancer treatment, Ken and Joni became stronger together and in their relationship with Christ. “This cancer was turning out to be a severe mercy. A bruising of a blessing, and a blessing out of brokenness” (pg. 154). Because of the trial of cancer, Ken and Joni fell in love all over again. Ken’s loving care for Joni increased. Joni’s respect for her husband grew and grew. Ken says, “Joni and I have talked about it, and I don’t think a lot of couples get a chance at a love like this, at closeness like this. It’s like all this has been a gift God has given us” (page 156). Joni agrees, “It’s like a wedding gift all over again. I would never thought this journey through cancer would have given us so much” (page 156). Catching a glimpse into Ken and Joni Tada’s marriage was a blessing and an encouragement. They are godly examples of love and faithfulness in marriage. This couple has faced hard times, and they have come out stronger and more in love. God has used the suffering in their lives to sanctify them and make them more like Christ. If you haven’t read previous books by Joni, or aren’t familiar with her life, then the book Joni and Ken might be a little bit confusing. It doesn’t give the details of Joni’s accident or her ministry, Joni and Friends. Reading her first book, Joni: An Unforgettable Story, will fill in more of the story of her life. When I reached the end of Joni and Ken: An Untold Love Story, I found myself wishing that it was a longer book! I wanted to know more, wanted to glean more wisdom from their years of marriage. This book is a treasure! If you are struggling through a marriage with a disability, or if you want to read an encouraging book about marriage, I recommend this book. You are not alone in the challenges you face. Let Ken and Joni encourage you to press on and remain faithful, even when marriage is hard. Would you like to learn more of Joni and Ken's story? Watch the video of Joni speaking at the National Religious Broadcasters Convention. Read on the Joni and Friends website, listen to Joni's radio programs, or browse the Joni and Friends store. I started this Saturday :) the struggle she had on the day she met him had tears streaming down my face. I'm eager to see how their relationship bloomed and on into being married. My favorite quote so far is in the prologue "a miracle is better than a fairy tale". Praying miracles for all three of us! The book made me cry too! It was beautiful to see how Ken really took responsibility and took care of Joni when she was sick with cancer and from chemo treatments. Enjoy the book! It is a blessing. wow this sounds like such a powerful book! thanks so much for sharing, i had not heard of it before!